Home / Medical Education is #NotATarget! The attacks on healthcare are a shocking reality of ongoing violent conflicts. Healthcare workers are being attacked, kidnapped, and killed. Healthcare facilities are damaged, looted, and bombed. The right to health is not upheld – populations suffering from the consequences of armed conflicts are not able to access the much needed services. In recent years, the issue of attacks on healthcare started to receive increased attention from the international community, especially with the UN Security Council resolution 2286, the first resolution strongly addressing attacks on health services in armed conflict. However, rhetorics concerning the issue of attacks on health care services usually focus the majority of their attention on health workers, facilities, and health systems as structures ensuring access to health care for populations. This makes perfect sense since the vast majority of attacks on health care target these objects. Health workers are the cornerstone of the provision of health care – without human resources for health, there is no health care at all. Yet, health workforce must be built, raised, and educated. Without the education services for health care, we skip the first and the foremost condition for strong and resilient health systems. After all, medical education is an integral component of every health system. The process of raising future health professionals is a pivotal condition of the sustainable health workforce. Therefore, any interference with medical education naturally impacts the ability of a health system to effectively deliver health care to its communities. These reasons led the International Federation of Medical Students’ Associations (IFMSA) to explore this area and compile its findings in the pilot report on Attacks on Medical Education. 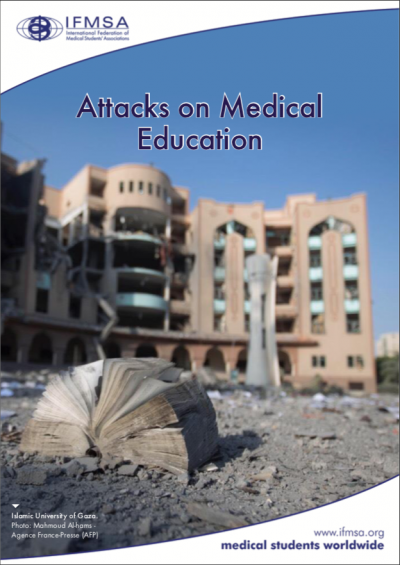 The report covers attacks on medical education in 7 countries, including Libya, Palestine, Ukraine, Sudan, Syria, Venezuela, and Yemen, and aims to explore an impact of violence on medical education, with its specific components, such as education facilities, teaching hospitals, libraries, professors, medical students and all other directly related components. The Attacks on Medical Education report expands the understanding of attack on healthcare by adding the unique aspect of medical education, opening a brand new area of possible consequences of attacks on healthcare services on health systems and their sustainability. You can view the report here. Ultimately, attacks on healthcare still remain a pressing concern. In addition, the effect of conflict on medical education raises numerous questions and must also be studied to explore its subsequent effect on the sustainability of health systems. We hope that through this report we empower and motivate actors to get involved and collaborate with IFMSA and its medical students to explore and map this specific area of violence against healthcare.